Of course singing has always been a social activity, both to participate in and to listen to. But at Denia Rock Choir, we really are the social media singers! The choir itself first came about as a result of a conversation on a Facebook group towards the end of last year. I was missing the Rock Choir sessions I’d enjoyed in a previous location and wondered whether we could get anything going locally, whether anyone was interested in doing something in Denia. The post grew as lots of people showed an interest. Which is great when it brings together people with a shared passion and intent, who want to back a new idea… but of course an idea in isolation never moved any mountains. Fortunately a chord was struck (sorry) with a few key people who were ready to put action together with the words, and a real willingness to make things happen started to emerge. The owners of Hostal Loreto supported the idea and offered use of their function room at a reduced cost, and the search was then on for someone to teach and conduct us. Finding Jan Dewland to be our choir director was the perfect solution, and made it possible to plan the first meetings of the group at the end of January. 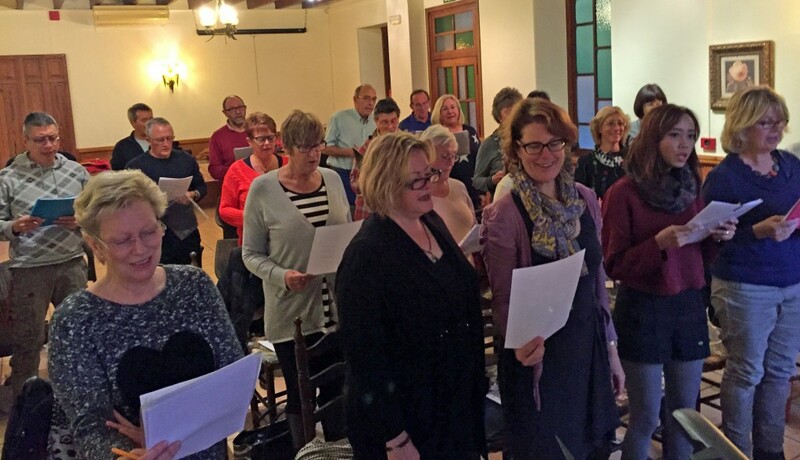 “Jan has taken a bunch of amateur singers, with widely varying voices and experiences, and managed to get us to sound great together!” said Clare Hunt, organiser and treasurer of the group. “We have a fluid kind of expat community here on the coast, with a lot of people who come and go, travelling and working in different places – but we have had between 15 and 22 people coming along each week, which means there are always enough for each part, and to feel you are part of a choir not a soloist! There are no auditions, and no pressure to commit”. Between our Thursday meetings, we keep in touch via a lively Facebook group, which is also great for those who can’t get to every session. It means we keep our singing time free to sing – and can use the group to discuss WHAT we are going to sing, a subject about which everybody inevitably has a unique viewpoint. We have a couple of Spotify playlists, which are collaborative for anyone to add to and listen to – one of them is our current repertoire of songs, and the other a highly diverse ‘wish list’… the songs we each enjoy singing along to in the shower or the car and would love to do in the group. “Some of the songs on the wish list are simply too advanced or demanding for the group at the moment, but it’s great to have options for the future”, said Jan. “Right now we are working on tracks by Adele, Simon and Garfunkel, Avicii, Coldplay and ELO. It’s quite a broad selection but most people are familiar with the melodies of many of them, and I create simple arrangements which let us explore the different vocal ranges of the group and have some fun with songs we love”. The Facebook group lets us distribute the lyrics too, so everyone can print their own – helping to keep the costs right down and make joining in as accessible and flexible as possible, everyone simply chipping in €5 per 90 minute session on a pay-as-you-go basis. Some people have learned a bit more about how Facebook groups work for sharing files, links and playlists – in a friendly and co-operative way where we all help each other get together and do what we enjoy. So Denia Rock Choir is a great example of how social media can become social in real life! And if you are anywhere near Denia and would like to come and join us, pop along to https://www.facebook.com/groups/DeniaRockChoir/ and get in touch, or simply come along to Hostal Loreto any Thursday evening at 6pm. All ages, nationalities and voices are welcome, to join our shared love of singing together in a group for fun.